Ask just about any kilt maker these days, if they make kilts for women, and most will answer yes. This response will irritate, if not infuriate most traditionalists, who would have us believe that only men may wear the kilt. And while it is certainly true that the kilt is traditionally a male garment, it has nonetheless evolved over the centuries, and the fact is, that nowadays women do wear kilts. So when a kilt maker makes kilts for women, do they use the same procedures as when making a traditional man's kilt? Well no not quite, traditional kilt making is designed to produce a kilt that looks stunning on a man. But men and woman's body shapes are very different, and this is why the kilt maker has to adapt his or her skills to accommodate the female body. For example they will make the kilt with darts in the front apron, to flatter the female form, and make the front apron narrower than a man's, to further flatter the woman's figure. 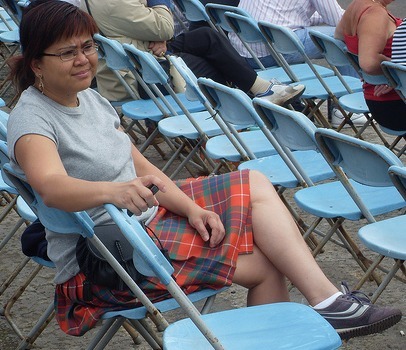 The photo below is a good example of how a kilt can look very attractive, being worn by a woman. This particular lady was hosting a Burns Supper, and is seen welcoming one of her guests. The lady in the next photo is wearing a kilt in the Fraser tartan. The fact that she is sitting down, enables us to see that the pleats in her kilt are not as deep as those you would find on a man's kilt. The next young lady wearing a kilt, is taking part in The Rock Trust kilt walk. It is a Scottish charity event, staged in Edinburgh, Scotland's capital city, where the participants are encouraged to take part wearing kilts. 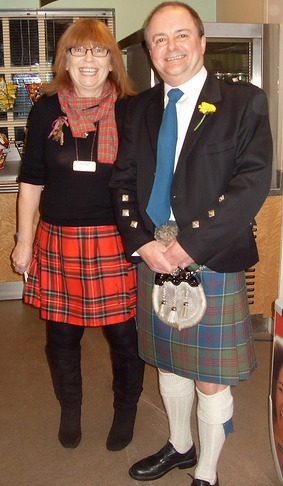 As the photographer Alex Cunningham stated, her hair and kilt are colour coordinated. A man's traditional kilt uses eight yards of twill woven worsted wool, with deep pleats, to ensure the kilt hangs and swings properly. Most women would not want to carry that much material around in their kilts, and that is one reason that less is used, so how much less? Well it depends on what the woman wants, her size naturally, how deep she wants the pleats, and how heavy she wants her kilt to be. But a good kilt maker would not use less than three yards of material, after all we are talking about a kilt here and not a skirt. Most kilt makers make their kilts for women with the apron fastening on the left hand side, whereas a traditional kilt for a man always has the apron fastening on the right. And men wear their kilts with accesories, kilt belt and sporran for example, these would not be seen being worn by women. So just how common are kilts for women? At the moment not that common, most women still prefer to wear a ladies kilt, which is in effect a tartan skirt, or for formal occasions a ladies evening kilt, which is full length. There is another popular way that women like to wear a kilt, or again I should say skirt, and that is the mini kilt, and this can be as short as eighteen inches. So there you have it, the kilt is no longer exclusive to men! women can and do wear them too. If you would like any further information on this, or any other page of the web site, then drop me a line using the Contact Us page, and I will be delighted to help.